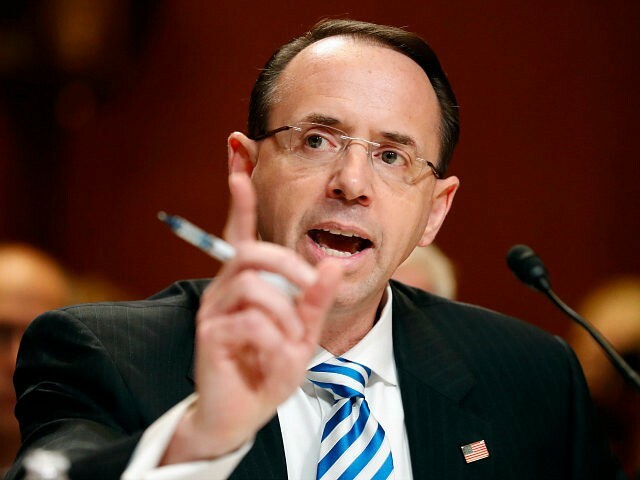 The vote escalates pressure on Deputy Attorney General Rod Rosenstein to hand over or provide adequate access to documents that have been subpoenaed months ago by members of Congress looking into potential misconduct by the DOJ and FBI in investigating the Trump campaign. Republican lawmakers requested documents as far back as last summer, but say they have been stonewalled by Justice and FBI officials. Members of Congress believe the DOJ and FBI are doing so to avoid embarrassment and scrutiny, while DOJ and FBI officials argue it could compromise the special counsel investigation. The resolution demands that Rosenstein turn over all requested documents by July 6. GOP lawmakers have said they could seek Rosenstein’s impeachment or hold him in contempt of Congress if he does not comply. Rosenstein and FBI Director Christopher Wray are also scheduled to testify in front of the House Judiciary Committee on Thursday, setting up a potential public showdown. Lawmakers’ demand for documents reached new urgency after the Justice Department Inspector General issued a report this month showing that five FBI agents who worked on the Clinton email investigation exchanged texts that showed bias against Trump. Strzok — who was the lead investigator on both the Clinton email and Trump-Russia investigations — had texted his lover FBI attorney Lisa Page, in August 2016, “We will stop” candidate Donald Trump from becoming president. The potential vote on Thursday shows the speed and seriousness with which Republicans are moving. The House Judiciary Committee just passed the resolution on Tuesday, in a 15-11 party-line vote. Democrats vociferously protested the resolution, calling it an attempt to undermine the special counsel investigation against Trump. The resolution was spearheaded by Reps. Jim Jordan (R-OH) and Mark Meadows (R-NC), the chairman of the House Freedom Caucus. “We want the full weight of the United States House of Representatives behind this resolution saying we are entitled, again, as a separate and equal branch of government, to get the information we need to do our oversight duty,” he added. Specifically, lawmakers are requesting information related to the FBI’s use of the unverified dossier on Trump commissioned by the Clinton campaign and the Democratic National Committee to obtain a surveillance warrant on former Trump campaign adviser Carter Page, as well as the FBI’s use of government informants who approached several Trump campaign advisers. The House Rules Committee is preparing to advance the resolution Wednesday afternoon, clearing it for a floor vote on Thursday.